Stewed pork with rice (lu rou fun 滷肉飯) is very popular anywhere in Taiwan from the market street food stalls to restaurants. Taiwanese stewed pork (滷肉 read as 'lu rou' in Mandarin or 'lor bak' in Hokkien) can be minced pork or pork cubes depending on which area of Taiwan you have this. In the north lu rou is always with minced pork while in the south cubes of pork is preferred. This stewed pork cubes posted today is similar to any Chinese hong shao rou (紅燒肉) with a few twists here and there. The flavour is much stronger than this hong shao rou due to the added dried shrimps and large amount of fried shallots. It is better to use pork with a bit of fat and skin like belly or shoulder. I always make a big pot whenever I cook this so I can save some for the freezer and for other recipes which I will post later. Hard boiled eggs cooked in the same sauce is something that goes so well with the pork. I love eggs stewed this way, it's quite flavourful. For this recipe, this will feed at least 6 people. You can put some in the freezer like I do or half the recipe. 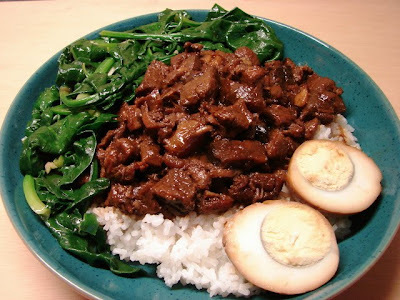 Recipe for the Stewed pork and eggs. Heat the oil then add garlic and ginger, stir for about a minute then add pork. Heat high and keep stirring slowly but continuously for about 5 minutes till pork has turned colour and some browning bits here and there. If the heat is not high the pork will stew and you will get lots of juice flooding the meat. Add mushroom, dried shrimps, 5 spice, peppercorns, light and dark soy, star anise, cinnamon and sugar. Keep stirring for another minute or two then add cooking wine and about 2 cups of water (some of this water can be from the mushroom soaking water), or enough water just about covering all the meat. Let this liquid come to the boil. Cover and simmer on low heat for about 30 - 40 minutes. Then add in hard boiled eggs, try to bury them in the sauce. Continue simmering for another 20 minutes or so till meat is tender, turning the eggs once or twice to evenly absorb the sauce. Finally add in the crushed fried shallots. Simmer for another 5 minutes then this stew is done. Have a taste if you like a bit more salty add more soy and more sugar if you like a bit sweeter. There may be quite a bit of fat floating on top of the sauce, you can skim if you want to. I always leave it in the fat has lots of flavour. This can be served right away or it is better to leave this meat and eggs for few hours at room temperature or overnight in the fridge then reheat before serving. One egg per person and as much meat as you like. Some Chinese green like pak choi, choi sum, kai lan or spinach. I was going to serve this with a light pickled cucumber but the plan did not work out because I missed it out on my shopping list. Yellow pickled Japanese/Korean daikon also goes well with this meat and rice. what kind of light soy sauce do you use? thank you. U MAKE A FAN OUT OF ME! Sunflower, you are a star. Have you got a recipe for pomelo skin braised in oyster sauce, please? I haven't eaten cooked pomelo skin (pith) for years. From what I can remember the pith needed to be blanched with several change of water to remove the bitterness before cooking. Then it is ready to cook with whatever you like, like pork ribs or dried baby anchovies ('silver fish') etc...not had it just with oyster sauce.